In my four decades of teaching, I went through a strike twice--once as a first year teacher, and once as the president of the local union. Writing about education, I have followed dozens more. No matter what kind of public support a strike is getting, there are always some familiar tunes you can expect to hear played in opposition to a teacher walkout. Here's your guide to all the classics. Don't they understand the district can't afford their demands? When we were strike, a member of the board's negotiating team said publicly, "Yes, we have the money. We just don't want to give it to them." That's not usually how it goes. Folks all the way up to former US Secretary of Education Arne Duncan have been chicken littling the impending financial doom of Los Angeles schools, and that's a fairly typical stance. Here's the thing to remember. When we were on strike, our state association sent us a trained education accountant to dig through the district's records (which, as a public school system, are completely public). By the time he was done, we knew as well as they did exactly what they could and could not afford. We kept that information in mind when negotiating because it would have been stupid to make demands that the district couldn't fund. When it comes to the financial side of negotiations, no union is flying blind, and no union is making demands that can't possibly be met. It's those damned union leaders. The teachers are fine, but those damned leaders are forcing them to strike. This tune appears in the coverage citing union president Alex Caputo-Pearl's "blind ambition." While people taking this approach often claim to love teachers, just not the union, this framing of a strike assumes that teachers are just a bunch of sheep that can be easily guided by a power-hungry union leader. Teachers are educated, used to working as individuals, and--this cannot be said often enough--not generally desirous of a walkout. Leading a teachers union is more like herding cats than sheep. And, as with most leadership positions, it's much more about following the group where it wants to go- not making up their minds for them. As the statewide strikes demonstrated last year, you can take away the union, and teachers will still find a way to unite and stand up. Striking is so unseemly and unprofessional. If teachers want to be treated like professionals, the argument goes, they should act like professionals, and professionals don't strike. Well, no. When your lawyer or your plumber decide they need to be paid more, they don't go on strike--they raise their rates, and the customers can take it or leave it. Nobody gets those kinds of benefits. This argument says that since people who work at box stores and gas stations get low pay and no benefits, why the heck do teachers need such great stuff? This is the race to the bottom. Rather than ask why teachers deserve a living wage and good benefits, better to ask why so many workers in other sectors do not. But wait--these teachers get great pay! The Los Angeles strike has brought up the question of how well teachers are already paid, though, of course, the LAUSD strike is about far more than teacher salaries. It is true that the average LAUSD salary is more than I ever made in a year of my entire career. It is also true that if my house were somehow replanted in L.A., it would cost ten times what I paid for it. My son lived in Los Angeles for a few years; I know how expensive it is to live there. LAUSD teachers are not overpaid. Nor are teachers generally overpaid compared to similarly-educated professions. Believe it or not, this is the objection that keeps striking teachers up at night. In fact, this might define the tipping point at which teachers walk out. On the one hand, there will be disruption and a loss of educational continuity while the strike is going on. On the other hand, things like 45-student classes are already damaging education for students, and will continue to do so for years to come. At some point, the short-term educational disruption for students right now has to be weighed against the long-term educational disruption of a system that is overcrowded, under-resourced, understaffed, and unable to attract the best teachers to work. Strikes happen when the needs of tomorrow's students loom large. I sympathize, but this is not the way. Ah, concern trolling. "You have a good point, but you're just hurting your own cause with this strike business. You should really find some other way." There's only one response to this song--what other way would you suggest. 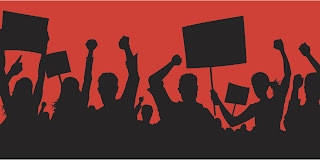 A strike is the tactic of last resort; when teachers strike, it's because every other option has been either been exhausted or ruled out by district administration. Sometimes what this objection means is "Strikes are hard on people and I really don't like it" and that's understandable. I don't think you can find a teacher anywhere--particularly one who has been on strike before--who would say, "Boy, I really wish I was on strike right now. Those were good times." But sometimes what this objection means is "I wish teachers would just complain in some way that was easy for everyone to ignore, like lighting candles at home or something that would let me pretend that nothing is wrong and nothing is happening" and even that is understandable, but of course it doesn't solve a thing. The worst version of this concern trolling is when it means "Teachers should not strike or complain at all. They should just accept what the district brass decide to give them. They should know their role and shut their hole." But here's the funny thing--even if you, for instance, rewrote state law so that teachers only had the shut up and behave option, you wouldn't end teacher walkouts. In those states, teachers still walk out--but they do it one at a time, and they never come back. That's why the state of Florida, as rough as they are on teachers, are not talking about any big strikes. Instead, they're talking about teacher shortages and the vast number of students being taught by non-certified teachers. In the end, while there are many reasons to be sad about a teacher strike, there is only one solution--the district creating a trustworthy path to resolution of the issues that the teachers have raised. Anything else is just whistling to pass the time. I've been working in "Fiscal Services" (accounting and budgeting) for school districts for the last ten years. I think that the problem of teachers not being paid a "living wage" is far deeper then "administration doesn't want to pay them". I think that a solution might lay in the question: Can we utilize teachers for the two months of summer? When teachers' pay is annualized they are paid well in line with other professionals, however taking two months off significantly reduces the actual annual salary. The other is realizing the STRS just like PERS for public employees is a huge benefit. School districts contribute over 18% of a teacher's salary in an employer match to Cal STRS. Good luck finding a private company that matches 18% salary for a 401k. Anyways, I'm not saying that teachers should not be paid more, I just think that we all need to have well rounded conversations.